Each week I get so excited to add another week to our positive and inspiring linkup! Can you believe it’s August already? This summer is flying by! 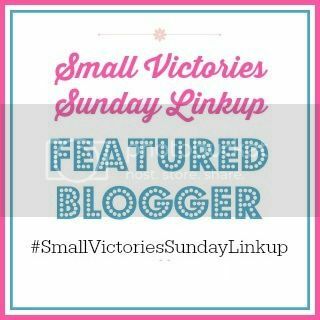 Small Victories Sunday Linkup is designed to linkup your BEST posts to inspire others to read, cook, craft, live well and blog well. Share with us anything that will help others live a happier and healthier life. Sunday is the perfect day to reflect and celebrate the week that passed and look forward to the week ahead. Our linkup is open all week long so feel free to stop by anytime, it’s never too late to linkup with us. If you need writing prompts or to see past linkups, visit our main Small Victories Sunday Linkup page. Each week my co-hosts and I will feature our favorite bloggers from the previous week’s linkup. Visit each of my co-hosts to see who they’ve featured too! Our Reader’s Choice for most clicked post was a tie between two of my favorite bloggers, what a coincidence! Fellow Tanya from Girl XOXO shared What’s In My Everyday Bag with the contents of her bag and an adorable ARC planner. Create with Joy shared Parenting in the Digital Age, an important resource for parents to use to keep their kids safe online. I didn’t know there was a subscription box site for resale women and kid’s clothing. With ThredUp, you can send in our own stuff for cash too! Check out Carrie Elle’s review of ThredUp here. Do you belong to a subscription service for clothes or books? Tell me! August means back to school and Life, Love and Thyme has great ideas for Back to School routines. I’ve been eating salads almost everyday for lunch and this Strawberry Tropical Salad with Ginger Dressing from Spoonful of Flavor looks fantastic! I’m halfway through The Tide Watchers by Lisa Chaplin, another chunkster for my Big Book Summer Challenge and a book set in the Napoleonic era in France and England for our Travel the World in Books Reading Challenge. A 19-year old woman turns to becoming a spy to save her infant son from her ex-husband. Full of history and intrigue, it’s quite a book. On the Kindle, I finished Flask of the Drunken Master by Susan Spann. I’m enjoying this mystery set during the samurai era in Japan, when a sake house owner is killed, samurai Hiro Hatsui and Jesuit priest Father Mateo must find the real murderer. They make an interesting duo. I’ll be bringing you a guest post on Friday by author Susan Spann about what inspired her to write these books and her amazing trip to Japan for research. This post linked up with SITS Sharefest . What are your small victories this week? Share your best posts, visit these other fantastic bloggers and celebrate small victories together! Want to join the #DanceWithJesus social chatter for a chance to win the $100 giveaway? See post 184. THANKS! I can’t believe that it’s August, our daughter registers for school tomorrow. Ug! Thanks for hosting, would love to have you at my Wednesday linkup, you are always so inspiring. Thanks again. Summer really did fly by! Thanks for the invite to your party, heading my way over to check it out! Sounds like you are rocking both the Big Book Summer Challenge and the Travel the World in Books Challenge, too. Yes, I can believe it is August – I am so relieved to say good-bye to July finally! I really need to write my reviews for the 2 big books I completed and the 3rd is almost done. I bet you are glad July is over and I’m very sorry for your loss. I have to admit, I’m always thrilled to hear from you and have you linkup with us. Thanks for sharing and supporting our linkup! Thanks so much for helping to spread the news about Parenting In The Digital Age – Keeping Your Children Safe and for hosting this awesome party each week! You’re very welcome, congrats on being one of the reader’s choice featured bloggers! I am glad I made it today! Thank you so much for the opportunity of this awesome link party, Tanya! You’re very welcome Debbie and hope you have a fabulous Sunday too! You’re always welcome Sherry. Thanks for continuing to support our linkup!